In less than a month, year 4 of open enrollment will begin, marking another critical opportunity to further expand health coverage through the health insurance marketplace. Though it has been a long and winding road, the Affordable Care Act’s expanded access to health coverage has been cited as one of the primary reasons that national and local uninsurance rates have dropped substantially over the last three years. Because Kansas and Missouri have continued to opt out of expanding Medicaid, the numbers of uninsured in our two states have declined, but at slower rates than in states that moved forward with expansion. According to the Centers for Medicare and Medicaid Services, 11.1 million Americans enrolled during the last open enrollment period, an increase of 1 million people from the prior period. Hopes are high that a similar increase will occur as marketplace enrollment begins November 1. In our six-county service area, health providers and advocates have focused their efforts on reaching individuals who are most underserved. 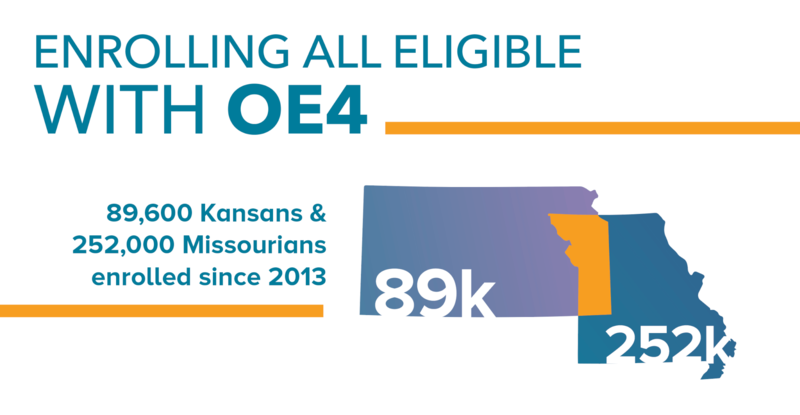 As part of our focused outcome – Enroll All Eligible – REACH will award $259,900 to 10 organizations in October to support outreach and enrollment activities. Grants will support in-person information and enrollment assistance; access to outreach and enrollment training, online appointment scheduling tools, digital marketing and technical assistance from Enroll America; access to bilingual assisters; outreach in rural communities; and other related work.